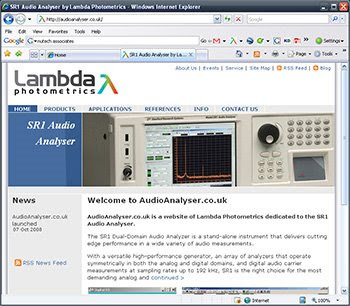 A blog written by the staff of Lambda Photometrics, providing informal information on Photonics and related scientific and engineering products and applications. The SR1 Audio Analyser Makes Waves at AES! 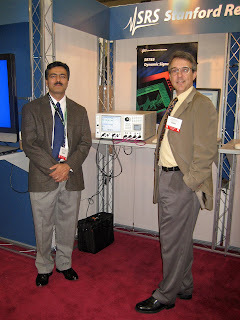 I was fortunate enough to be able to attend the 125th AES convention in San Francisco on 3rd-5th October 2008, to witness the launch of the new SR1 Audio Analyser from Stanford Research Systems (SRS). With many years of success in the scientific instrumentation and test & measurement markets, SRS have been able to produce a high-end product at a low-budget price. The SR1 is targeted at the flagship AP2700 Series from Audio Precision, and provdes a similar specification at a fraction of the cost. The SR1 contains an embedded PC for stand-alone operation, and is a dual domain (analogue & digital) instrument with true two channel FFT analysers. The full specification set is included as standard - without the need for a long list of extra cost options required to configure your basic instrument. SRS also used this opportunity to launch the SR10, SR11 & SR12 family of audio switches for use with the SR1. 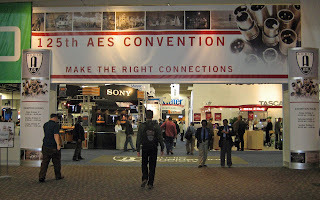 Members of the SR1 design team were on-hand at AES to help with detailed technical discussions, and we were all pleased at the universally positive reaction. Comments included “thanks for injecting some real competition into this market”, “you’ll have great success with this”, “this specification for such a low price is incredible”. This has to be one of the most enjoyable exhibitions I've been involved with. It was great to be present for the launch of a new product into a new market, to witness the high level of interest and universally positive reponse, and of course to have the chance to look at all that tempting pro-audio kit! The first SR1 units are due to ship in January 2009, and if you would like more information please visit our new dedicated Audio Analyser website http://www.audioanalyser.co.uk/. If you have any questions, just let us know. We look forward to talking to you about the SR1! The site provides all the latest news, specifications and product information for the SR1 Audio Analyser, and we'll shortly be adding application information, product demonstration videos and much more. Fantastic news this week as Stanford Research have now launched the SR1 Audio Analyser. The SR1 is a dual-domain analyser that consists of a high high-performance waveform generator with an array of analyzers that operate symmetrically in both the analog and digital domains. 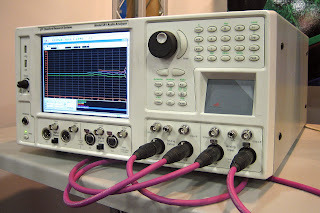 The waveforms generator can produce sine, synchronous burst sine, noise (white, pink, and filtered), standard intermodulation test signals (SMPTE, CCIF, DIM), square waves, arbitrary waveforms (ASCII and .WAV), ramps and multitone waveforms. Single-Channel FFT and Dual-Channel FFT Analyzers providing live spectral displays with full zoom and heterodyne capability. Multitone Analyzer for fast single-shot measurements of a variety of audio parameters including Level, Frequency Response, THD+N, THD Total Distortion, Noise, Crosstalk, and IMD. We're very excited by this product as it's got a very impressive spec at a great price. We'll add more details as soon as we get them.